This article is a short summary of Pokémon Ultra Sun and Ultra Moon. 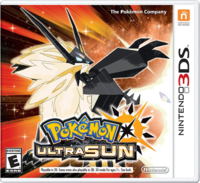 Pokémon Ultra Sun and Pokémon Ultra Moon are the ninth pair of installments in the core Pokémon series, released for Nintendo 3DS in November 2017, serving as follow-ups to the previous games, Pokémon Sun and Moon. The games were revealed during the June 2017 Pokémon Direct. Ultra Sun and Ultra Moon feature an alternate storyline set in the Alola region, with Pokémon that did not appear in the original games. A new light shines on the Alola region! 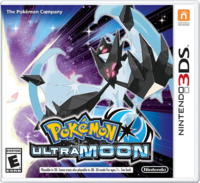 Take on the role of a Pokémon Trainer and unravel the mystery behind the Legendary Pokémon Necrozma’s two new forms: Dusk Mane Necrozma in the Pokémon™ Ultra Sun game and Dawn Wings Necrozma in Pokémon Ultra Moon game. A brand-new showdown awaits! New Pokémon forms have been discovered in the Alola region! The legendary Pokémon Necrozma has transformed into two new forms: Dusk Mane Necrozma, who took over Solgaleo in Pokémon Ultra Sun, and Dawn Wings Necrozma who took over Lunala in Pokémon Ultra Moon. Head out on an epic journey as a Pokémon Trainer and solve the mystery behind these fascinating Pokémon, explore more of the Alola region, catch more amazing Pokémon, and battle more formidable foes in Pokémon Ultra Sun and Pokémon Ultra Moon! Pokémon Ultra Sun and Ultra Moon were originally announced during a brief Pokémon Direct on June 6, 2017. According to director Kazumasa Iwao, the games were developed by a staff of around 80 people total, around half the size of the team that worked on the original Sun and Moon. Game Freak director Shigeru Ohmori has stated that the team believes that they have pushed the Nintendo 3DS system to the absolute limits of its capabilities after previously having thought so with Pokémon X and Y and Pokémon Sun and Moon, calling them "the culmination of our work with the 3DS system." ↑ 1.0 1.1 1.2 Pokémon Direct 6.6.2017. Nintendo (YouTube; June 6, 2017). Retrieved June 6, 2017. ↑ Press Release from Nintendo of Korea (June 7, 2017). Retrieved June 9, 2017. ↑ Nintendo AU NZ on Twitter (August 20, 2017). Retrieved August 22, 2017. ↑ Pokémon UK on Twitter (August 18, 2017). Retrieved August 22, 2017. ↑ 5.0 5.1 Ultra Sun and Ultra Moon Will Be the Last Pokemon RPGs for 3DS. IGN (October 19, 2017). Retrieved October 19, 2017. This page was last edited on 2 March 2019, at 06:48.